Catnap Sleepwear is an up-and-coming ‘luxury sleepwear and lifestyle label’ specializing in bespoke pyjamas, pillows, bed linen, and more. Their prints are fun and quirky, and everything can be tailor-made to your measurements. 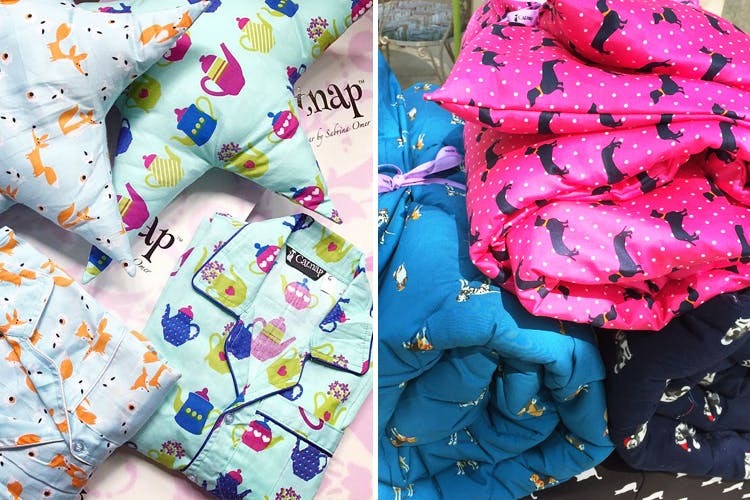 Started in 2016 out of her bedroom, Sabrina Omer wanted to ‘provide everything that you need in your bedroom from sleepwear to pillowcases, quilts, cushions, bedside lamps, customised towels, and even bridal trousseau’; and so, Catnap was born. You can find them at pop-ups and exhibitions across Pune, or set up an appointment with Sabrina at her home in Koregaon Park. We love their patterns and prints – varying from puppies and pineapples, to cupcakes and cats. Be it strappy or sleeveless, short or long-sleeved, there’s something from everyone, whether you’re an adult or a kid. Standard sizing is available, but if you’re an in-between size or would prefer something more tailored, you can come in for a fitting as well. Even their packaging is adorable, wrapped in layers of pretty paper with a ribbon on top! Starting at Rs. 1800 (shirt and shorts set) upwards, you can place your orders through Instagram, Facebook, or by contacting Sabrina directly. If you’d prefer a plain colour over print, you can get your name or initials embroidered onto it for a personalised touch. They can even make matching pyjamas for your pet! Imagine that.